Groundwater Management Area 12 (GMA12) is located over the Carrizo-Wilcox Aquifer Group. Bastrop, Texas. March 7, 2012. The Texas Water Development Board held a groundwater hearing on March 7, 2012, in the Milano Civic Center, Milano, TX. Environmental Stewardship presented evidence on its appeal of the adopted desired future conditions of Groundwater Management Area 12 (GMA-12). The hearing focused on the damage to surface water and water rights resulting form over-pumping the aquifers. The public was encouraged to attend but did not have the opportunity to comment at the hearing. Interested persons had 10 business days in which to submit sworn written evidence. Other interested party evidence was provided by George Rice (Hydrologist), Neighbors for Neighbors, Curtis Chubb, Ph.D., and Environmental Stewardship. The Texas Water Development Board (TWDB) is expected to render a decision on the appeal at their June 21, 2012, Board Meeting to be held in Austin, TX. The staff recommendations should be available to the public on June 14. GMA-12 manages groundwater in Central Texas (Bastrop, Brazos, Burleson, Falls, Fayette, Freestone, Lee, Leon, Limestone, Madison, Milam, Navarro, Robertson, and Williamson counties). Click here for the hearing notice; Click here for previous Smithville Times article, Click here for press release. Over 2,000 owners of Colorado and Brazos River water rights may be affected by the amount of groundwater pumping recently approved by groundwater conservation districts within Groundwater Management Area 12 (GMA-12). The detrimental effects on surface water rights was brought to light the hearing held in Milano, TX on March 7, 2012 before the Texas Water Development Board (TWDB). The documents were filed by Environmental Stewardship, as a part of challenging GMA 12’s determination of desired future conditions for seven aquifers underlying Central Texas. 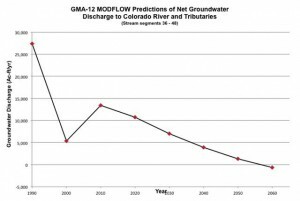 Our basic challenge is that the pumping policies of groundwater districts within GMA 12 will damage the Colorado and Brazos Rivers by decreasing the aquifers’ contribution to surface flows. During Environmental Stewardship’s preparation for the hearing, we gathered data supporting the conclusions that over 1,150 surface water right permits in the Colorado River basin and over 880 surface water right permits in the Brazos River basin would be affected by GMA 12’s groundwater pumping decisions. A total of 12-13 billion gallons of river flow could be lost per year due to the groundwater levels being too low to contribute to surface water flows. “The withdrawal of these huge volumes of water from the rivers will also damage the land, bays and estuaries that depend on the freshwater that flows from the aquifers” said Steve Box, Executive Director of Environmental Stewardship. He also said, “If surface water right permit owners in these basins are concerned, they should call or write their legislators and let them know that this just isn’t right.” In addition, written sworn testimony concerning GMA 12’s actions will be accepted by TWDB up to March 21. Click here for How Can I Help? Environmental Stewardship contends that the desired future conditions adopted by GMA-12 fail to protect the Colorado and Brazos rivers, area springs and streams, and the loblolly pine forests know as the Lost Pines. According to the Texas Water Development Board’s model, there has been a dramatic decrease in water flowing from the aquifers to these surface features in the past that well be made worse with the planned future pumping. The GMA-12 has failed to make adjustments to minimize these impacts. In addition, water from Bastrop and nearby counties is being marketed to other areas without a careful analysis of water’s present and future availability. By filing the petition, Environmental Stewardship has taken the first step. We have opened the door to greater local control and responsible management of our water resources, endorsing Lost Pines GCD’s goal to sustainably manage our groundwater. We urge all who share our vision of Central Texas with its rivers, streams, trees, and wildlife to join us. The issue is now; the solutions are now, but we need your help. We can only open the door; it is up to you, the citizens, to determine what kind of future you and your children will share. Bastrop, Texas. 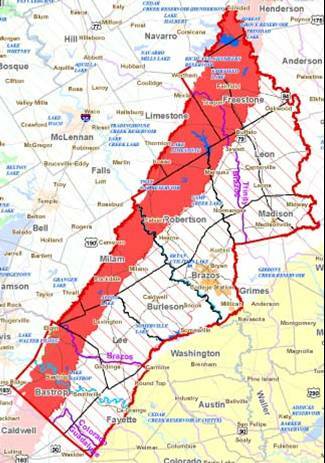 On June 30, 2011, Environmental Stewardship submitted a petition to Groundwater Management Area 12 (GMA-12) appealing the desired future conditions for the aquifers within all areas of groundwater management in Area 12 – Central Texas (Bastrop, Brazos, Burleson, Falls, Fayette, Freestone, Lee, Leon, Limestone, Madison, Milam, Navarro, Robertson, and Williamson counties). The petition was submitted to the Texas Water Development Board (TWDB) on August 1, 2011, and has been accepted as a “reviewable petition”. A 60 day extension has been granted to the GMA-12 by the TWDB as requested by Brazos Valley Groundwater Conservation District. As such, a public hearing in a central location will not be scheduled by the TWDB until sometime after October 11, 2011. According to the Texas Water Code, groundwater conservation districts within each GMA are required to define “desired future conditions” for the groundwater resources within the area. A desired future condition is simply a measurement of future groundwater conditions that help determine the future of our aquifers and thus our supply of water. The Texas Water Development Board determines how much groundwater is available for withdrawal; these decisions establish the future of groundwater resources across the state. Write or Call your Groundwater Conservation District and the Texas Water Development Board. Let them know your concerns and that you support Environmental Stewardship’s petition. Make a Donation – Please consider a tax-deductible donation to help us with the substantial expenses associated with this action. Environmental Stewardship has taken the lead on behalf of the area’s resources and citizens to question current practices and to provide reliable scientific information. We are motivated by concern for the area’s natural resources that have taken millennia to develop but may be destroyed by careless disregard in a matter of a few years. Environmental Stewardship is reaching out to all citizens and groups, urging every Texan to become informed and to join in its efforts to preserve the supply of our most precious resource. The graph to the left sums up the concerns raised by Environmental Stewardship in the petition. Historically the Colorado River and its tributaries gained about 25-30,000 acre feet of water per year from the aquifers as it flowed through Bastrop County. Pumping for mining operations in the 1990’s averaged about 23,000 acre feet per year until 1999 when they pumped 37,787 acre feet. As depicted in the graph, the model used by the GMA-12 in setting the desired future conditions seems to shows the impact of the groundwater pumping for this mining operation. After 2000, the operator reduced its pumping to about 8-10,000 acre feet per year. The graph shows a corresponding rebound in the the discharge to the Colorado River and its tributaries to about 14,000 acre feet per year according to the model (about 50% of the historic discharge). The planning period for the desired future conditions is 2010-2060. As depicted in the graph, the discharge to the river and its tributaries is estimated to become ZERO and then negative during the planning period. In September, 2010, Lost Pines Groundwater Conservation District installed remote monitoring equipment on six wells that are located in the Simsboro Aquifer in Bastrop and Lee counties. As reported in the June 23, 2011, article Drought dropping Simsboro aquifer, the Heart of Texas well in Lee County dropped 18 feet in two months (As of August, 2011, the well has now dropped 27+ feet). “As the drought continues,” district manager Joe Cooper said, “and as we add pumping we will see even more declines.” “The Simsboro is being looked at as the Mecca to supply water for all of south-central Texas,” Cooper said. “We don’t think that’s possible and we’re starting to get data that shows that.” And Environmental Stewardship agrees. Petition Summary: Groundwater Management Area 12 (“GMA-12”) adopted desired future conditions (DFCs) do not adequately consider the groundwater-surface water relationships and does not include protection for the Colorado and Brazos rivers, streams and springs in the region as they are impacted by projected pumping of water from the Carrizo-Wilcox Aquifer Group, Queen City Aquifer, Sparta Aquifer, Yegua-Jackson Aquifer, and the Brazos River Alluvium Aquifer within the boundaries of Groundwater Management Area 12. Based on modeling by the Texas Water Development Board, outflows to springs and surface waters in the GMA-12 have declined by approximately 50% from 1980 to 1999. 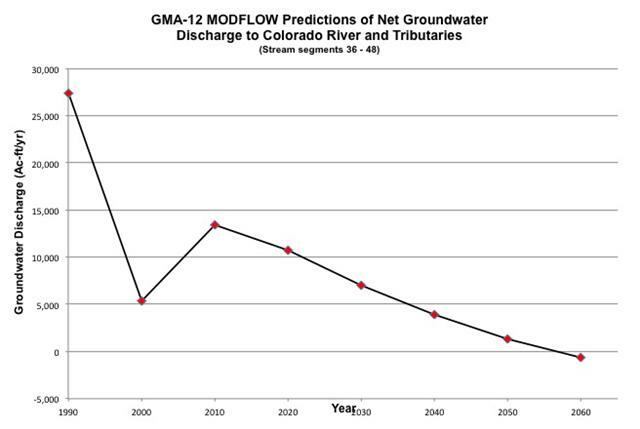 GMA-12 has not considered a similar “water budget” to determine whether or not this trend is expected to continue through the planning period and has not made adjustments in DFC to mitigate this trend and its impacts on the surface waters and associated ecological and socio-economic impacts on the region as required by Texas laws and regulations. Further, the DFC are based on the 2007 Texas Water Plan demand projections (forward approach) rather than being based on the more scientifically valid “iterative approach” that would estimate the quantity of water the aquifers can yield without being damaged or without damaging the groundwater-surface water relationship. Over-pumping that will result from the adopted DFCs unreasonably threaten the groundwater-surface water relationship and will harm terrestrial and surface water resources that depend on outflows of water to the surface. Though there is adequate quantitative data on the Colorado River to consider impacts of the DFCs on the river, these data were not used and the adopted DFCs pose significant risks to the river and its tributaries, especially during periods of drought. Texas Parks and Wildlife Department data were offered but not considered in the DFC process. Groundwater models make adequate provision for rivers, streams and springs to include in DFCs and numerous public interests urged consideration of these impacts, yet these were not considered and these surface waters will be unreasonably harmed by the adopted DFC. The adopted DFCs did not consider numerous springs that could have been quantitatively included and, therefore, the adopted DFC will cause unreasonable harm which will likely cause many to go dry. Flow measurement technology exists to quantitatively monitor river and spring flows in order to protect rivers and springs from unintended consequences, yet these technologies were not considered and are not employed to monitor the impacts of the DFC. Unreasonably harmful socio-economic impacts will be experienced by the region due to over-pumping (over-drafting) of the aquifers that will result from the adopted DFCs. The adopted DFCs will make it difficult, if not impossible, for the Lost Pines GCD to meet its commitment to sustainable management of the aquifers. At § 36.0015, Chapter 36 of the Texas Water Code establishes that Groundwater districts are created to provide for the conservation, preservation, protection, recharging and prevention of waste of groundwater. The adopted DFCs wholly fail to ensure the conservation, preservation and protection of the subject aquifers, and in this fashion the adopted DFCs are contrary to the intents and purposes of the Texas Water Code. The adopted DFCs do not consider and include the citizen’s desire to have the rivers, streams and springs protected as voiced in Opportunity Bastrop County. PETITION APPEALING THE DESIRED FUTURE CONDITIONS OF GMA-12 Posted June 30, 2011, 6:36 pm. ATTACHMENT B – Resolution adopted by ES describing the authority of Mr. Box. APPENDIX G – TPWD offer of data. Post Oak Savannah Groundwater conservation District, Groundwater Management Area 12 Meeting Minutes, March 1, 2007 – 10:00 a.m. Public Comments: Dan Opoyke (Opdyke). APPENDIX I – Texas Parks and Wildlife Department letter to GMA-12 dated October 30, 2008, Texas Water Project letter to GMA-12 dated October 30, 2008. ATTACHMENT J – Low Flow Gain-Loss Study of the Colorado River in Texas, Geoffrey P. Saunders, Lower Colorado River Authority. 2006. In Aquifers of the Gulf Coast of Texas. TWDB publication 365. Aquifers of the Gulf Coast of Texas. TWDB publication 365 (Chapter 19). ATTACHMENT K – Low-Flow Gain-Loss Study of the Colorado River in Bastrop County, Texas. Geoffrey P. Saunders, Lower Colorado River Authority. In Aquifers of the Upper Coastal Plains of Texas. Texas Water Development Board Report 374, October 2009. ATTACHMENT L – Surface Water–Groundwater Interaction in the Central Carrizo-Wilcox Aquifer by David O’Rourke and Ken Choffel. HDR Engineering Services, Inc.
ATTACHMENT M – A list of about thirty (30) springs and seeps that have been partially documented along the Colorado River and elsewhere in Bastrop County. Many springs provide base-flows to the creeks and streams in the counties, such as the two on Alum Creek, a tributary to the Colorado that emerges from the Lost Pines in the Bastrop State Park area. ATTACHMENT N – Maps of the “Wilbarger” and “El Camino Real” Paddling Trails prepared by Environmental Stewardship and TPWD identifying the location of the many springs that have been documented along the reach of the Colorado River between Utley and Tahitian Village in Bastrop County. ATTACHMENT R – 2006 Region “K” Water Plan for the Lower Colorado Regional Water Planning Group, Section 8A-8, RESOLUTION OF THE LOWER COLORADO REGIONAL WATER PLANNING GROUP REGARDING MINING OF GROUNDWATER, February 9, 2000. ATTACHMENT S – Groundwater Availability in the Carrizo-Wilcox Aquifer in Central Texas – Numerical Simulation of 2000 through 2050 Withdrawal Projections. Alan R. Dutton. Report of Investigation No. 256. 1999. See Simulation 5, pages 22-42 (Table 5). ATTACHMENT T – Environmental Stewardship letter to Lost Pines GCD dated June 18, 2008. ATTACHMENT U – Lost Pines Groundwater Conservation District Management Plan, September 15, 2004, Revised: August 10, 2010. Pages 1, 18-20. ATTACHMENT V – GMA 12 Meeting Consultants Progress Report, Milano Community and Civic Center, Milano, Texas, August 28, 2008. ATTACHMENT W – Drought dropping Simsboro aquifer, The Bastrop Advertiser and The Smithville Times, June 23, 2011. ATTACHMENT AA – Socio-Economic Impacts of DFC Groundwater Over-draft – Bastrop & Lee Counties. Environmental Stewardship. 2011. ATTACHMENT BB – Opportunity Bastrop County. Adopted by Bastrop County Commissioners Court, December 10, 2007. Environmental Exerts. ATTACHMENT CC – Environmental Stewardship letter to Lost Pines GCD dated May 21, 2008. EXHIBIT 14 U.S. Fish and Wildlife Service. Environmental Assessment for Programmatic Safe Harbor Agreement for the Houston Toad in Texas. EXHIBIT 36 Lost Pines Groundwater Conservation District Management Plan. Revised August 10, 2010, Approved by TWDB 10/25/2012. Groundwater Availability Model for the Central Part of the Carrizo-Wilcox Aquifer inTexas. Alan R. Dutton, Bob Harden, Jean-Philippe Nicot, and David O’Rourke. February 2003.